Greetings on a lovely Saturday Morning. Fall is in the air, the evenings are finally getting cool and it might be time to start the holiday knitting. Here at Knitting Addiction we are busy knitting new samples from Malabrigo WORSTED... the shipment arrived on Wednesday and skeins are running out the door! We ordered a lovely assortment of 20 colors, it is soft and delightful. Come check it out. While you are at the shop take a minute to say hi to the "new girl" Lisa. You'll know her by the big smile and the cheery greetings. So on to the reason for a "new girl"- Britt has, after great thought and much, Much, MUCH deliberating, decided she is going to take a job at Willard and Kelsey, a solar glass manufacturing plant, in Ohio. (Translation: she's leaving us!) The job is a great opportunity and a chance to be there as a new and upcoming business starts to grow. Short term will have Britt here at the shop through November, and then she's off to Ohio. The new job will eventually take Britt to sunny Florida- we know she loves sunshine best, so we are wishing her all the very best. I'd like to invite all who want to attend to a "Best of New Beginnings" party to send Britt off with flair. 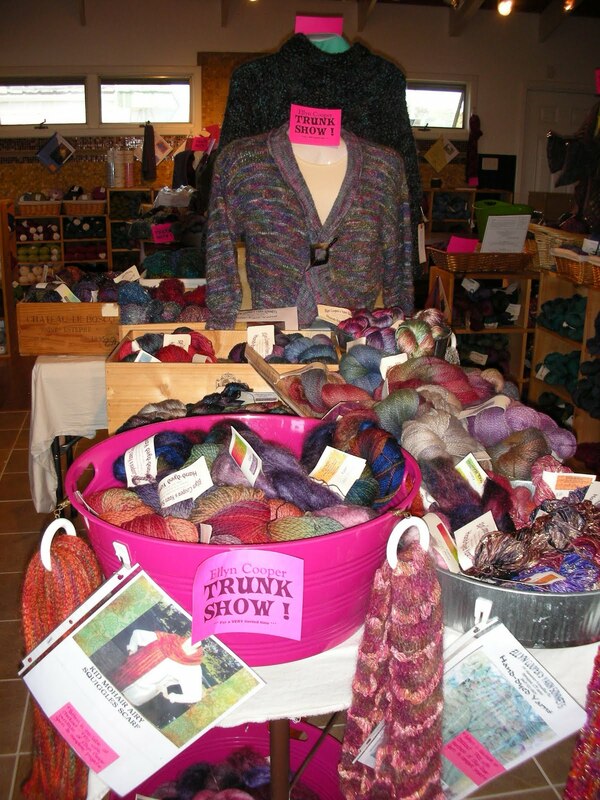 It will be here at Knitting Addiction, Sunday, November 21 from 2-4 (it's also Britt's birthday). Please come drop in, give Britt a big hug and wish her well on her new adventure. We will miss her like crazy, but most of us knew she was a gypsy at heart. We were lucky to have her here at Knitting Addiction for 5 great years. Greetings from the slightly soggy Outer Banks! 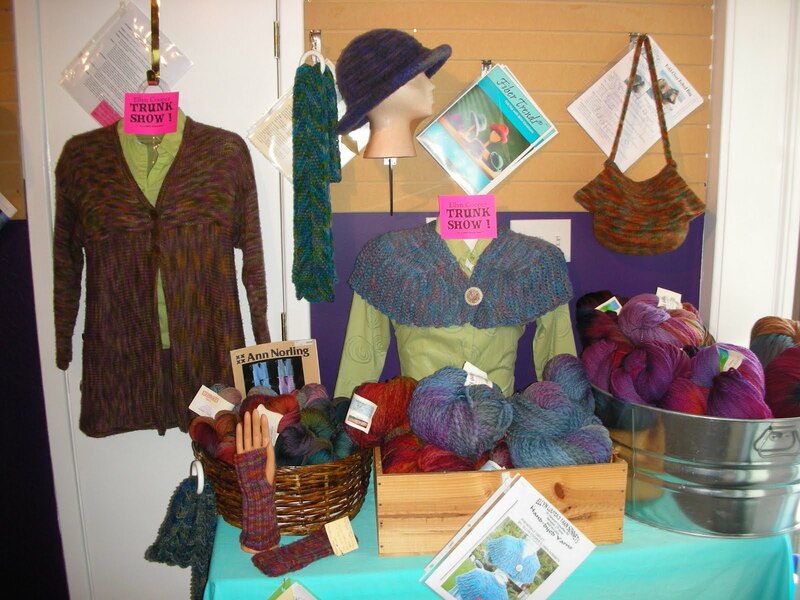 Thanks to all who called and emailed to check in on us at Knitting Addiction. Most now know that the storm was a media circus brought to you by the Weather Channel and all the wind associated with the storm was from Jim Cantore's incessant yammering. Good grief- just hush already! The storm brought lots of wind, lots of rain, some flooding in the usual places. I worked several hours with the fire department during the storm, which lead to KA being closed on Friday. If we missed you Friday, or late Thursday, we hope you came back to see us on Saturday or are planning to see us some time on Monday. Best of a quiet Sunday to all. Greetings from my kitchen counter! 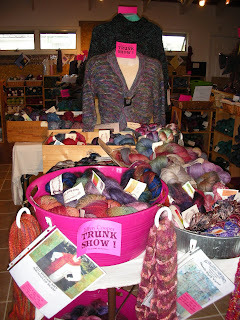 It's been a while since I've blogged- time really flies when you are having fun running a great yarn store! We are working hard and really getting excited about what the summer will bring. There has been a definite change of pace at the new location, so there are some challenges that come with the change in pace. We are analyzing the inventory, investigating what new things to add, including a couple really helpful people, and in general gearing up for a busy summer season. Lots of cool stuff getting knitted and shown off around the shop. I am remiss in not having pictures of all of the following to show off on the blog, but I have to mention a couple really neat finished projects customers brought in to let us see. Dee started the recent stuffed critter craze, knitting the giraffe out of Itty Bitty Toys, by Susan Anderson. Then came the monkey. Then Kathryn saw the giraffe and had to get in on the fun. Another giraffe out of "Spud and Chloe", an amazingly cute lamb with "Heaven" fluff, the long puppy that can wrap up in an itty bitty blanket and plans for a fantastic purple sock yarn hippo. Britt and I are contemplating the projects we should knit out of "Itty Bitty Toys". The book rocks if you have small people to knit for and are bored with sweaters. Newport Cotton by Ellyn Cooper has been a popular yarn for the spring. It has been knitted into several cute summer sweaters and I just finished the "Waves and Sunsets" wrap out of it. Newport is a really beautiful mercerized cotton, dyed in Ellyn's signature colors and wonderful to knit. The "Waves" wrap is a simple rectangle worked in version of feather and fan to really show off the amazing colors. It has been a huge hit since I finished it. The pattern is written and the sample is out and available to swish around your shoulders to try on. The drape and weight are amazing. It should be a great wardrobe addition to a sundress or simple summer outfit. 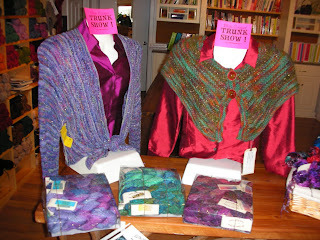 Several new and fun "not yarn" additions have been added to the inventory at Knitting Addiction. We have a fresh shipment of Circular Needle Clutches by "Offhand Designs". They are simply the best storage option I have ever used for circular knitting needles. I have the sleeves of mine labeled by size of needle and I typically have multiple sets of a size in a sleeve. 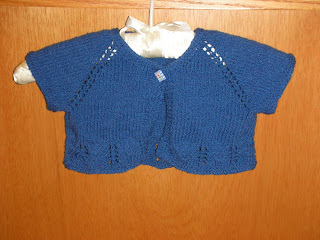 Mine easily contains size 2- 13 needles with some sleeves to spare. It has been in use for nearly 5 years and still looks like new, even after a minor event with a certain black dog when she was a puppy. A bit of an investment at first, but well worth it to have your stock of circular needles in one easy location. We also have a new double point needle storage option. Karen from "Karen's Kreations" has created a great double point roll that can easily keep a dozen sets of double point needles contained and organized. Great fabrics, accented with clever buttons and velcro to keep it folded and tidy make for a really nice addition to a well organized knitting bag. Karen has also created a great "Bucket Bag" that has tons of space for projects, clever pockets and a sturdy drawstring handle. Yippee for the grommet set! 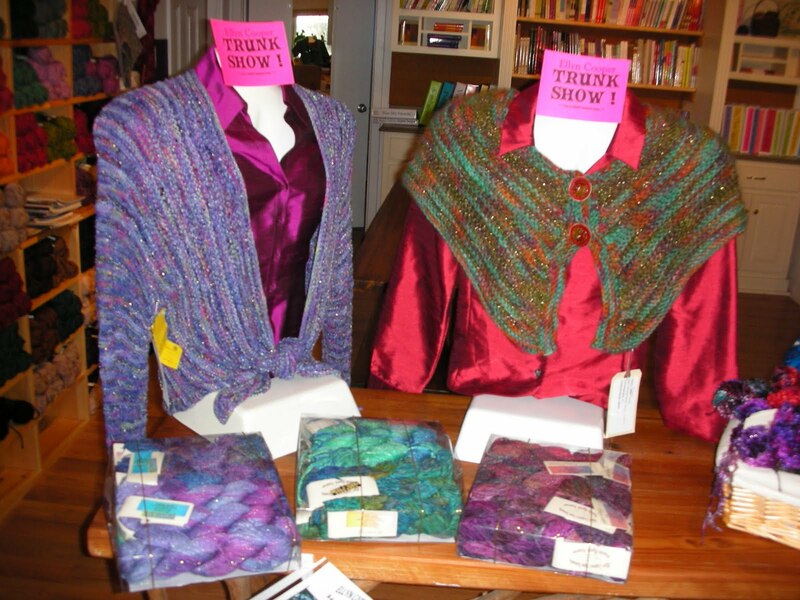 We just added "Knitknotes" this week. If you have ever struggled with how to let the lucky recipient of a knitted gift know that you knitted it, Knitknotes might be for you. Cute cards with clever sayings like, "I made this. You better love it." come packaged 4 to a pack with matching envelopes for $4.50. There are several sayings to pick from and a great card with care instructions to let folks know to be gentle with your labor of love. On cards and notes we also added in Gayle Adoline's clever hand-crafted cards. (If the name is not ringing a bell, that's Britt's mom, creator of all sorts of clever things- yarn ball wreathes anyone?) Gayle is sending us selections of cards created with knitters in mind. Cute birthday and greeting wishes, all handmade and all really cute. The selection will change with the week, so check them out when you come in. The rain has taken a break and I'm ready to get out and get a short run in, so I'm going to end this one for now.